Beauty has been redefined through the ages, but bright, healthy skin and graceful aging has stood the esthetic test of time. Modern clients are quickly recognizing the importance of overall wellness and how it directly relates to beautiful skin. So, how does good skincare relate to lifestyle? To answer that question, let’s take a journey to the Blue Zone. Blue Zones are geographical locations where people live longer than most. The term Blue Zone was originally coined by Dan Buettner, a researcher, who used a blue pen to circle areas of a map where the largest grouping of centenarians (100-year-olds) were recorded. Okinawa, Japan, the Italian island of Sardinia, Costa Rica's Nicoya peninsula, Ikaria, Greece, and Loma Linda, California. These regions share several correlating internal and external anti-aging factors including inflammation reduction, antioxidant intake and healthy habits. Blue Zone dwellers practice natural diets consisting of vegetables, grains, legumes, honey, omega-rich fish and nuts, as well as natural probiotics like yogurt. Water from these Blue Zone regions are also mineral-rich and high in calcium and magnesium. Exercise is not a chore; it’s built into everyday life. Tending to orchards, gardens and other physical labor are all part of the routine. These outdoor activities allow for smart sun exposure on the arms and legs for increased vitamin D.
They get just the right amount of sleep. It has been scientifically proven that seven to eight and a half hours per night is key for immune system boosting and repair. Listening, laughing, meditating, graciousness and mindfulness are all a part of their culture. They also dedicate a day to rest to enjoy the sanctuary of personal time. Blue Zone ingredients like MASQ-techTM skin illumination technology was introduced by Lira Clinical in 2013. MASQ-techTM is a trademarked combination of different forms of Mastiha. Mastiha is a hand-picked tree resin harvested on various Greek islands. This powerful ingredient contains a multitude of topical and internal benefits including anti-inflammatory properties, antioxidants, anti-bacterial, anti-microbial, pore refining, collagen boosting and skin brightening. MASQ-techTMcan be found in several products and throughout the MYSTIQ Line. 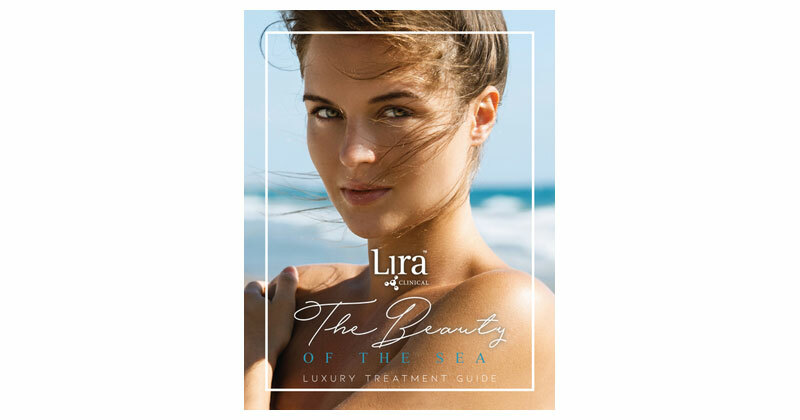 Lira Clinical’s ocean-inspired treatment guide includes Blue Zone friendly products and facial protocols with brightening coastal botanicals and nourishing marine based ingredients. This award-winning brightening and hydrating beauty oil contains 12 botanical oils, including Mastiha oil, Madonna Lily plant stem cell and BV-OSC lipid soluble vitamin C.
Rich in omega fatty acids, colloidal gold and silver, this luxury hydrator restores damaged skin and improves hydration retention. An essential brightening exfoliator that features antioxidants like MASQ-techTM, orange plant stem cell, tomato extract, mandelic acid and summer snowflake. This universal tinted sunscreen contains nourishing ingredients like cucumber and thyme paired with advanced ceramide technology to restore healthy barrier function.